Xiaonei, the company that likes to call itself the “Facebook of China” has raised a whopping $430 million from financial backers. This is probably the biggest investment ever in China into a startup. Xiaonei is owned by Oak Pacific Interactive (OPI), a holding company with a number of online communities. The backing gives it a larger financial warchest than Facebook itself, and sets the scene for a showdown with the American company. 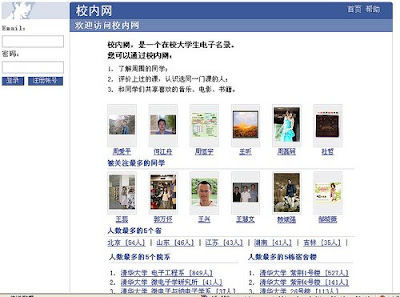 Facebook has just started to get serious about entering the huge, fast-growing Chinese market. The lead investor of this big round is Softbank, Japan and the CEO, Masayoshi San, an iconic Japanese investor will be joining the Board of OPI. Xiaonei's features include include multiplayer gaming and wireless services for mobile users. In the college market, Xiaonei.com claims a dominant market share, but hasn’t released any specific user data In a report cited via Pacific Epoch, Xiaonei had 22 million registered users and 12.7 million daily users by March with a 280 million page views. With the size of the investment, Xiaonei certainly has lots of options to further expand itself into the Chinese market to fend off any possible competitors. They are in great financial shape after this big round but I think Xiaonei has alot to buck up if they want to compete head on with Facebook who has a more robust and dynamic social networking platform. Whatever the outcome, lets all congratulate OPI for reaching another milestone for raising the biggest investment ever in China. They certainly know how to nail down their investors. Internet world can be also used as an investment. I think the reason is China has the largest number of internet users.